Across many ancient civilizations throughout the world, love was placed under the domain of a certain deity, usually, but not in all cases, a goddess. In the Classical world, for instance, there were Venus and Aphrodite, love goddesses of the Roman and Greek pantheons respectively. In the ancient Near East, love was personified in such goddesses as Ishtar and Astarte. Further afield in West Africa, the Yoruba people believe in a love goddess by the name of Oshun. The Yoruba people inhabit the south-western part of modern day Nigeria and the southern part of Benin. 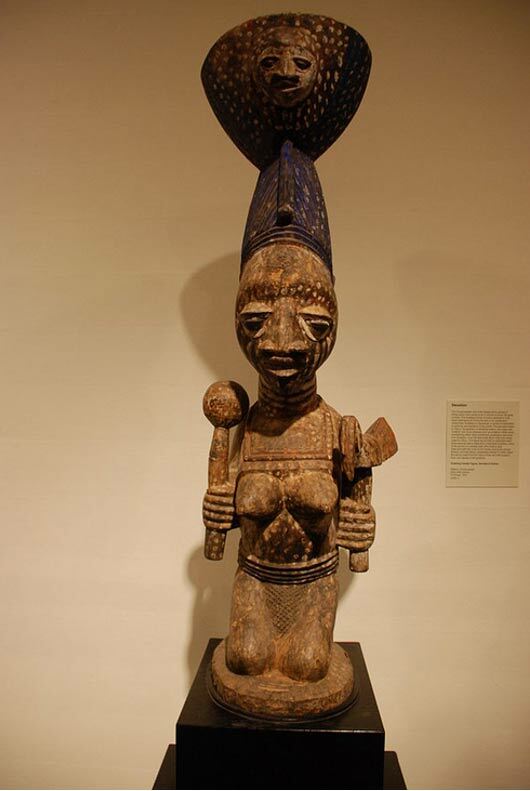 Practitioners of traditional Yoruba religion believe in a pantheon of 401 gods (known as Orisha) who govern various aspects of the world and human life. Although Oshun (also spelt Osun) is regarded principally as a goddess of love, there are other aspects to this Orisha as well. One of the most important roles that Oshun plays is that of the goddess of the sweet waters and the protective deity of the River Oshun in Nigeria. Alongside this river is a sacred grove, probably the last in Yoruba Culture, dedicated to Oshun. The Osun-Osogbo Sacred Grove is a dense forest on the outskirts of Osogbo town, western Nigeria. In the past, sacred groves were commonly found in areas where the Yoruba lived, and every town would have had one. Over time, these sacred groves were either abandoned or shrank in size, apart from the Osun-Osogbo Sacred Grove. This sacred grove contains 40 shrines, 2 palaces, as well as many sculptures and works of arts. Due to its unique status, the Osun-Osongbo Sacred Grove was inscribed in UNESCO’s World Heritage List in 2005. In one story, villages from a nearby area were migrating in search of water, and settled in along the river near the present town of Osogbo. What the new settlers did not know was that this land belonged to Oshun. One day, when the community was preparing the ground for the planting season, a tree fell into the river, and a voice was heard from the river saying: “You have destroyed my dyeing pots.” This filled the villagers with fear, and they sought to appease the goddess. They were successful in their undertaking, and Oshun advised the settlers to move to the upper part of the river, for humans and spirits could not live together. The villagers complied with Oshun’s command, and the former settlement became the Osun-Osongbo Sacred Grove. Although Oshun governs love and the sweet waters, she is also regarded as a highly benevolent deity. Oshun is said to be the protector of the poor and the mother of all orphans. It is Oshun who brings to them their needs in this life. Additionally, Oshun is regarded as a healer of the sick, the bringer of song, music and dance, as well as prosperity and fertility. Oshun is also depicted as a teacher, who taught the Yoruba agriculture, culture and mysticism. She also taught them the art of divination using cowrie shells, as well as songs, chants and meditations taught to her by her father Obatala, the first of the created Orishi. 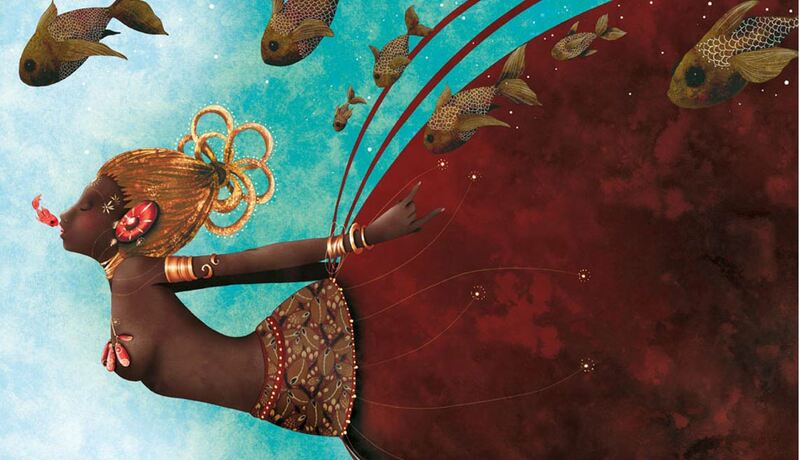 In art, Oshun is depicted like many of her counterparts from other cultures. Oshun is commonly shown as a beautiful, charming, sensual and coquettish young woman. In addition to her natural beauty, Oshun is also adorned with such ornaments as gold jewellery, brass bracelets, beads, mirrors and elaborate fans. It is also claimed that Oshun is attracted to all things that glitter and are shiny. In some stories, Oshun is depicted as a mermaid with a fish tail, perhaps as an allusion to her status as the goddess of sweet waters. During the African diaspora, Oshun was brought to the Americas, and was subsequently adopted into the pantheons that branched out of the traditional African belief system. Today, Oshun is still honoured in Nigeria in the annual ceremony called Ibo-Osun, as well as the 12 day Osun-Osogbo that takes place at the Osun-Osogbo Sacred Grove each year at the end of June to the beginning of August. Featured image: An artist’s depiction of Oshun. Photo source: www.reunionblackfamily.com. Orisha are those magic Bulgarian deities who make you follow their will in your human destiny. Orisha means Charming, Making do into Bulgarian language. In North West Bulgaria there is a village still existing today called Osun and a river nearby called Osum. The villages in this part of Bulgaria are at least 9000 years old and many artefacts from this prehistoric period have been found. Yoruba is also a Bulgarian word and means the South (Yo) RuBa (God Ra AllFather of Ancient Bulgarians) Southern God as Afrika is situated South from today Bulgaria. Admin take note., its OSUN not OSHUN. Ḏḥwty surely this fish-tailed culture bringing goddess is a form of Oannes? Osun/Oshun = O-un-s? Read more about Xochiquetzal: Aztec Goddess of Beauty, Pleasure and Love… But Don’t Mess With Her!